New! Will Willimon's "Fear of The Other: No Fear In Love"
New Wednesday morning book study announced. 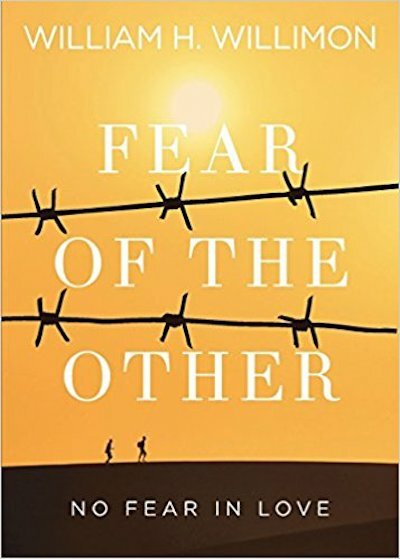 Begins May 16th, 2018 at 10:00am we will start Will Willimon's book "Fear of the Other: No Fear in Love." In this no non-sense book, reliable spiritual guide, Will Willimon, invites readers to consider the gospel command to love (and not merely tolerate) those considered to be “Other” or outside mainstream Christian culture. Rooted in the faith of Israel and the Christian story and vision, Willimon brings a Wesleyan perspective to bear on what may be the hardest thing for people of faith to do: keeping and loving the "Other" as they are - without any need for them to become like us. Emphasizing biblical teaching to receive Others for who they are and their differences as gifts and mysteries bearing the grace of God, Willimon also offers a strong critique of the privileged who all too often rush to speak of reconciliation and evade the injustice of huge inequalities faced by foreigners and strangers - as well as the antagonism the stranger experiences. He identifies concrete, everyday ways persons are formed in welcoming others without annihilating their differences. Rooted in the New Testament understanding of Gentile outsiders grafted into the covenant community, Willimon invites readers to an on-the-ground faith that remembers the God who comes to us again and again through so-called outsiders, strangers, immigrants, and those without status. Beyond welcome, Christians must become “other” to the world, shaking off the dominant culture’s identity and privilege through practices of listening, humility, and understanding." Come Join Us! Books are $13 each and scholarships are available. You can find the books and sign up sheets outside of Pastor Wilds office.